Order your favorite boxed chocolates that you and your family have enjoyed for over 60 years. A masterful selection of flavors and textures; sure to delight your eyes and please your palate! A delightful assortment of milk chocolate covered nuts, cremes, butter caramel, cherry cordials, meltaways, soft centers and a variety of other fillings. Rich, flavorable dark chocolate covers a variety of delicious gourmet centers, including cherry cordials, nuts, caramel, soft creme centers, meltaways and more. Soft, creamy centers of orange, cocoa, raspberry, butter, maple nut, vanilla and moist coconut covered in rich milk and dark chocolate. Milk or dark chocolate covered cherry cordials, butter caramels, cremes, nuts, meltaways, soft centers and more. Milk chocolate covered assortment of roasted almonds, crisp pecans, whole brazil nuts, roasted cashews and peanut clusters. A delight for the chocolate covered nuts! 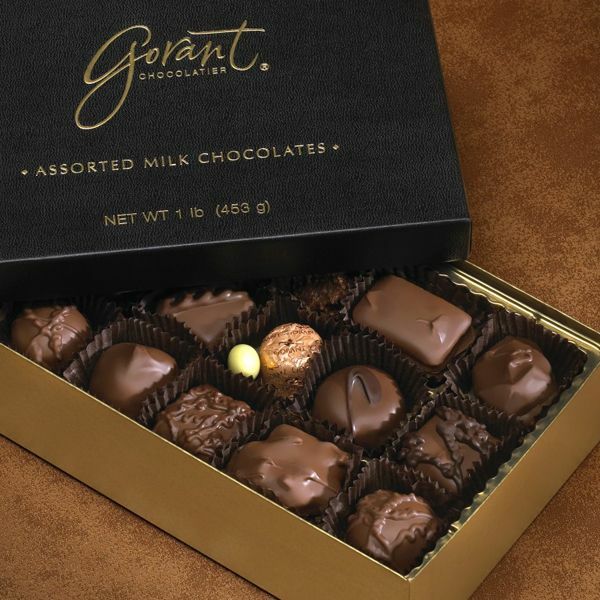 A wide variety of milk and dark chocolate truffles with creamy, exotic flavors! This is a Special Occasion treat of MANY flavors. Gourmet assortment of that will thrill your taste buds. A beautifully gold gift wrapped one pound box of a unique selection of English almond toffee, milk chocolate covered apricots, pecans, almonds, filbert truffles and cherry cordials. This selection is very popular with the gourmet assortment of milk & dark chocolates. 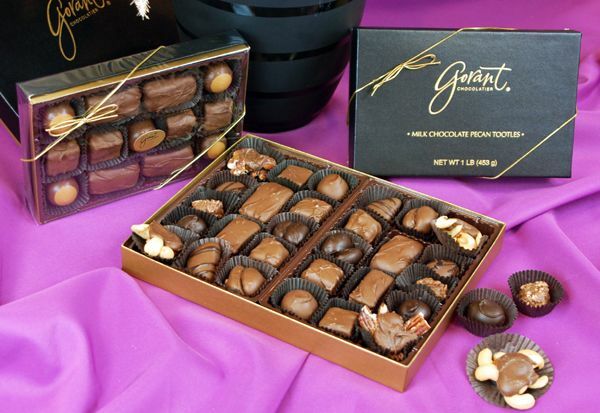 An assortment of milk and dark chocolate covered butter caramels, nuts, honey almond nougatines and more! Milk or dark chocolate covered plump, juicy, sweet cherries with rich, sensational flavor. Velvety smooth milk or dark chocolate superbly blended with a cool refreshing mint. A customer favorite! Velvety smooth milk or dark chocolate blended with roasted almond slivers. This delight is a special Gorant recipe and a customer favorite! Smooth, creamy peanut butter center covered in milk chocolate. Special recipe of peanut butter filling makes this treat extra special. Another popular favorite of customers! Milk or dark chocolate covers creamy, buttery caramel and fresh, crisp pecans. Another customer favorite to savor! For the cashew lovers. Rich milk chocolate covered whole cashews, cashew clusters, cashew patties, caramel cashew tootles and cashew galores.